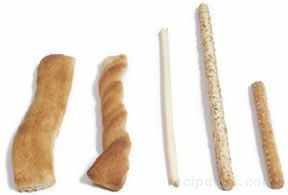 A traditional Italian breadstick that is made from dough that is elastic in texture allowing for the shaping of a long and very thin stick. The breadstick is coated with extra virgin olive oil and then baked from 12 to 20 minutes, depending on the crispness desired. There are a number of variations, some made with sesame seeds, others with herbs, tomatoes, or parmesan cheese. Grissini is often served with appetizers, soups, stews, or simply as a snack.